Pregnancy heartburn is enough to make the sweetest, most docile woman turn into a fire-breathing dragon. The pressure of a growing belly puts a strain on the woman’s diaphragm, causing unwanted and very unpleasant heartburn, an almost unavoidable side effect of pregnancy. It can be downright miserable if left untreated. So what’s a mama to do? First of all, put down the anti acid pills and reach for something that will actually work! 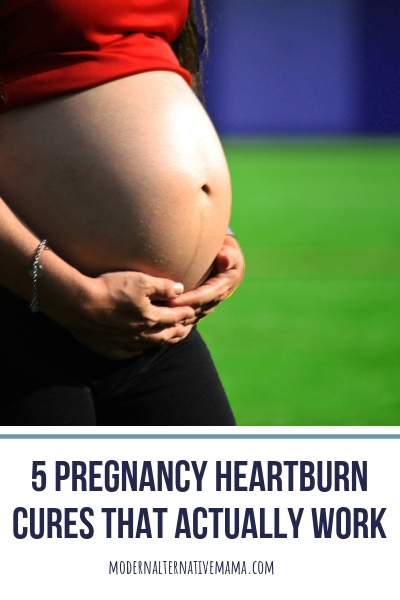 These five pregnancy heartburn cures that actually work are sure to bring relief to you if you find yourself struggling with pregnancy heartburn. I lived on papaya enzymes through each of my seven pregnancies. I was so grateful to find a natural remedy for pregnancy heartburn that actually worked to take care of my pregnancy heartburn. They are mild tasting, which also helps for those moms might also feel nausea along with heartburn. If you are one of those mommies, papaya enzymes are a great choice. They work to calm the stomach acid and help get the digestive juices flowing in the right direction. Balancing the gut flora is one of the best ways to cure pregnancy heartburn. Now, probiotics aren’t necessarily a rescue remedy in the moment of need, but rather, a way to stave off pregnancy heartburn to begin with. A good probiotic will help prevent pregnancy heartburn from even starting. I was leery, the first time I heard of almonds helping with pregnancy heartburn. What?? That seemed impossible. How could a nut calm down the fire burning from my insides? In desperation, I reached for the almonds, and sure enough — they worked! Just take a small handful and nibble on them while sipping water. The heartburn should calm down quickly. And when it returns — and you know it will — you can easily munch on more almonds, knowing that not only have you found a good and natural alternative to heartburn medications, but you are also nourishing your body and your growing little sweet pea. It seems strange that chewing gum would help treat pregnancy heartburn, but it does. When you chew gum, it helps stimulate the salivary glands in your mouth, which then, in turn, aids in digestion, keeping your belly free of the acid and essentially calming heartburn. Choose spearmint or peppermint as an added bonus to help give your digestive system an added boost. You may have heard that drinking a glass of milk will help treat pregnancy heartburn, but it’s actually the opposite. Milk may help in the moment, but in the end, may actually make heartburn worse. Components in milk, may cause the stomach to produce extra acid, which in turn, will create more heartburn. Not a good situation if you’re already dealing with the unpleasant effects of heartburn. It’s best to avoid dairy altogether if you’re serious about stopping pregnancy heartburn in its tracks. But take heart — it’s only for a season. You won’t need to give it up forever. Now that we’ve talked about the five pregnancy heartburn cures that actually work, let’s talk for a moment about some ways you can be proactive in stopping heartburn before it starts. Don’t eat too late at night. As tempting as it is to eat a midnight snack — don’t do it! Digesting food at night will put undue stress on your body and cause your tummy to not be happy. Your digestion is slower when you’re pregnant and adding food to your belly at night will only slow things down, causing you to experience heartburn. In the same manner, feeding your body smaller meals will help to not overtax your body and will make digestion easier. Therefore, you will be eliminating heartburn before it even starts. Don’t lie down immediately after eating. I know that everything is exhausting these days. Even eating a meal is enough to make you want a nap. That’s totally fine. Just wait at least 15 minutes after your meal before lying down. If you can wait longer, that would be even more ideal. That way your body will have time to start digesting your food and stomach acid will be less likely to seep up into your esophagus, causing heartburn. Go for a walk instead. I know! It’s probably not the first idea on your mind when you just feel like taking a nap, but if you can get up from the dinner table and take a walk, you’ll be doing your body a favor. Walking helps everything in your body speed up, therefore it’s great for digestion. Do those even exist when you’re pregnant? I know that it’s fun to be in style and there are so many cute pregnancy clothes available, but really, it’s best to choose comfort over cuteness. You’ll get back into your fashionable clothes soon enough. But, for now, do yourself a favor and don’t wear pants that are too tight. It will make your tummy angry and heartburn will be imminent. Pregnancy seems like a never-ending battle with the scale. Of course you need to gain weight while pregnant and dieting is never an option when you’re expecting. Nevertheless, it’s important to make sure you are gaining the appropriate amount of weight and staying within a healthy range for your body structure. Maintaining a healthy weight while pregnant will help you win the battle with heartburn. Check out this post for ways to use herbal tea for common pregnancy symptoms, including heartburn, of course! It won’t be long and the fire-breathing dragon days will be over and you’ll be holding your sweet, little bundle of joy. Let me remind you of that cherished moment. The heartburn seems awful now, but soon you will see that it was all worth it! In the meantime, be sure to try these five pregnancy heartburn cures that actually work. 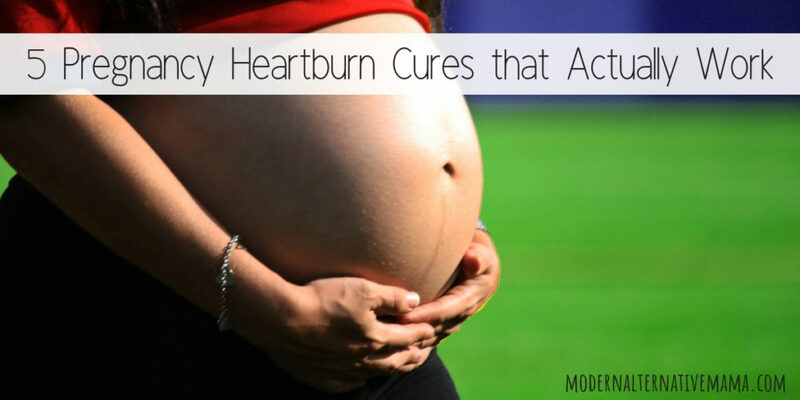 What cures for pregnancy heartburn have you tried? Do you have remedies that you would add to the list? Amber is the proud mama to seven great kids ranging in age from 16 years old all the way down to 6 months. She is married to Ben who also happens to be her pastor. Amber has a passion for helping people and enjoys finding new recipes to accommodate the various food allergies of several of her kids as well as her husband. She homeschools all her kids and has a love for things all natural. Finding ways to eat clean and natural is a high priority. No preservatives for this girl! I wish those had worked and gave them all a good try! Even zantac only worked about 50% with my last pregnancy. It was so bad! Fortunately as soon as baby was born, it went away! Glad these work for other people though!